Tired of packing a lunch and eating it in Andersen Library while you study? Or, enjoy music with your lunch at the Library any day! Choose something unfamiliar from the Browsing CD collection on 2nd floor. It’s got everything from yodeling to opera, along with rock, folk, world music, classical, and more. 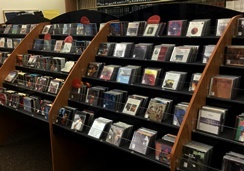 There also are streaming music databases on the database list like DRAM; Music Online’s Jazz Music Library, Garland Encyclopedia of World Music, African American Music Reference; and Naxos. This entry was posted in around the library, around wisconsin and tagged audio recordings, CDs, fun stuff, music, streaming audio databases. Bookmark the permalink.